The Cassini-Huygens probe has seen what appear to be methane clouds and a giant impact crater on its first flyby of Saturn's biggest moon, Titan. The spacecraft used its instruments to peer through the haze of the moon's atmosphere to detect surface features in unprecedented detail. Cassini flew to within 350,000km of the moon, the first of more than 40 visits it will make in the next four years. The most prominent feature seen was a region of cumulus-like cloud near the south pole, which scientists say was about 450km across and about 15km above the surface. 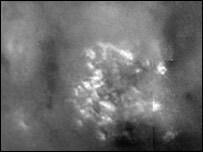 The Cassini data indicates the clouds are probably made from hydrocarbons, and may be associated with a ground feature. "We may have some wind motion lifting up methane-laden air to the point where it can condense out to form clouds," said Dr Kevin Baines, a Cassini science-team member. Titan's dense atmosphere is opaque at most wavelengths, but the spacecraft captured some surface details, including a possible crater, through wavelengths in which the atmosphere is clear. "Although the initial images appear bland and hard to interpret, we're happy to report that, with a combination of instruments, we have indeed seen Titan's surface with unprecedented clarity. "We also look forward to future, much closer flybys and use of radar for much greater levels of surface detail," said colleague Dr Dennis Matson. Cassini's October flyby will get to within 1,200km of Titan's surface. Interpretation will then take on more certainty. For now, scientists are hypothesising that the lighter areas are regions of the surface which may be covered with water-ice mixed with hydrocarbon "contaminants" such as methane. The darker areas may be regions of more pure water-ice. "We are seeing variation in the surface brightness of features. Some are circular; others are linear. There appear to be some concentric features near the south pole," said imaging scientist Dr Elizabeth Turtle. "The fact that we're not seeing just circular blobs all over the place suggests it's not just a heavily cratered body - there has been geologic activity going on." 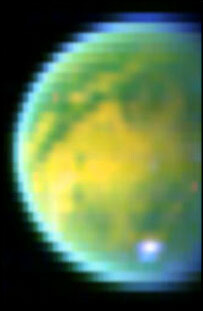 The study of Titan is one of the major goals of the Cassini-Huygens mission. Titan may preserve in deep-freeze many chemical compounds that preceded life on Earth. In January 2005, the Huygens probe that is now attached to Cassini will descend through Titan's atmosphere to the surface. The joint US-European Cassini-Huygens venture arrived at Saturn on Thursday. During the manoeuvre to insert the spacecraft in orbit, Cassini took remarkable images of Saturn's rings. Some pictures showed patterned density waves in the rings, resembling stripes of varying width. Another revealed a ring's "scalloped" edge. Scientists can now see that Saturn's rings are almost exclusively composed of water-ice. What is more, the particles between the rings seem remarkably similar to the dark material that Cassini saw on Saturn's moon, Phoebe. These dark particles refuel the theory that the rings might be the remnants of a moon. The mission has also detected large quantities of oxygen at the edge of the rings. Scientists are still trying to understand these results, but they think the oxygen may be left over from a collision that occurred as recently as January of this year. "This has been an epic journey across our Solar System"